The bearded iris is a long-living perennial that produces large spring-blooming flowers with petals that hang like a beard. The plant is available in re-blooming varieties with a second bloom time in late summer or early fall. Bearded iris in USDA growing zone 9 should be planted in late summer in a well-draining soil with full sunlight. The bearded iris will grow to a height up to 25 inches, depending on the variety. Prepare the bearded iris planting area by working two to three inches of organic compost into the soil with a tiller. Test the soil to verify it has a pH of 6.0 to 7.0. Work ground rock sulfur into the soil to lower the pH number or limestone to raise the pH number. Let the soil rest for two weeks prior to planting. 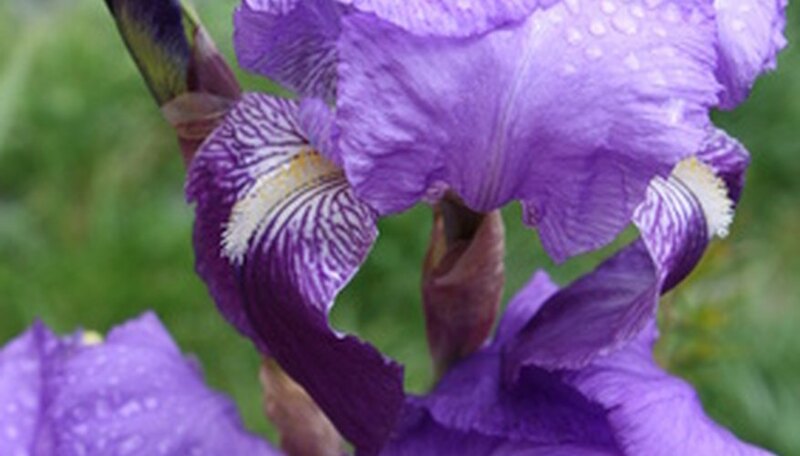 Plant the bearded iris by digging a hole that is deep enough to accommodate the rhizome. Mound soil in the center of the hole and place the rhizome so the roots spread over the mound and the top of the rhizome is just above soil level. Space the plants eight to ten inches apart. Water the bearded iris generously after planting, to stimulate growth. Apply supplemental water during the growing season to keep the soil evenly moist. Remove flower stalks from the plant by cutting them to a height of one to two inches as they dry out. This will prevent seed growth and force plant energy into rhizome growth. Cut back bearded iris leaves in early fall to a height of six to eight inches. Fertilize bearded iris plants with a 5-10-10 fertilizer at a rate of 1/2 cup per plant clump, after flowering is complete. Apply the fertilizer around the rhizomes to prevent contact burn from the chemical. Cultivate around the iris plants by working the soil to a depth of one to two inches. This will assist with weed removal and provide oxygen to the soil. Iris plants do not respond well to mulch over the root structure. Divide bearded iris rhizomes every three to five years to prevent the plants from becoming crowded. Cut the leaves to one-third their length four to six weeks after flowering is complete. Dig the plant from the ground and gently break apart the rhizomes into clumps that have at least one fan of leaves. Replant the smaller clumps.